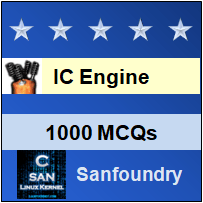 This set of IC Engines Multiple Choice Questions & Answers (MCQs) focuses on “Engine Performance Parameters”. Explanation: Relative efficiency is defined as the ratio of indicated thermal efficiency to the corresponding air standard cycle efficiency. a) the ratio of volumes of air in cylinder before compression stroke and after compression stroke. b) volume displaced by piston per stroke and clearance volume in cylinder. c) ratio of pressure after compression and before compression. Explanation: Indicated power of a 4-stroke engine is equal to pLAN/2.